This week friends of mine in Mississippi and families in many other states were devastated by terrifying tornadoes. I have been glued to Facebook feeds to make sure friends and their families survived, along with their pets, homes and businesses. As the storms passed, communities came together. Mississippi State's baseball team helped build storm shelters, students collected toiletries and cleaning supplies - together entire communities started the process of cleaning debris and rebuilding. Spring brings sometimes violent weather extremes - our area is currently under a flash flood warning. As caregivers we have to be prepared for whatever weather spring sends us. We can't predict the weather, the only thing we can be is prepared. Click here for tips to get you started preparing for any kind of disaster. For more tips and information call, 800.272.3900. Caregiver University! It is hard to imagine we are nearly half way through our Caregiver University events! Our friends are Cabell Huntington Hospital are graciously hosting us next week! Find a Caregiver University near you and register! Thanks for the Memories Luncheon is May 29, please join us to honor Senator Rockefeller with the Legacy Award for his continued and outstanding service to families, not only in West Virginia, facing Alzheimer's and dementia. His footprint on the cause of Alzheimer's disease is great and unmatched. Order your tickets or sponsor a table by calling 800.272.3900 or click here. Have you checked out our community calendar? Ok, I really do eat very healthy. And it is this healthy eating that drove my desire for my own ice cream maker - so I could whip up healthy sorbets and ice cream concoctions. So what do I make first? Indulgently creamy vanilla ice cream, while we are going rich and delicious might as well go all the way with Bananas Foster and go all the way. Only make and eat after a day of hard labor, really. So here is the ice cream recipe I used. Over med/low heat melt butter and stir in brown sugar and cinnamon, mix in the cream and stir until sugar dissolves. Peel bananas and cut in half lengthwise, then cut in half again. Add the bananas, and continue to cook until bananas soften (happens pretty quickly). As soon as the bananas soften, add the rum on top, turn off the heat and light on fire! 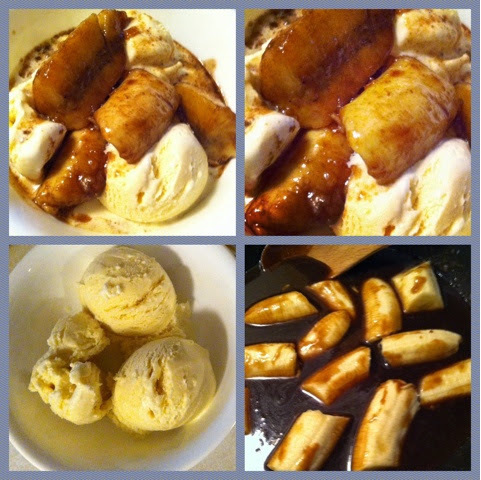 Spoon out a few bananas on top of a few scoops of ice cream, then drizzle with the delicious sauce.